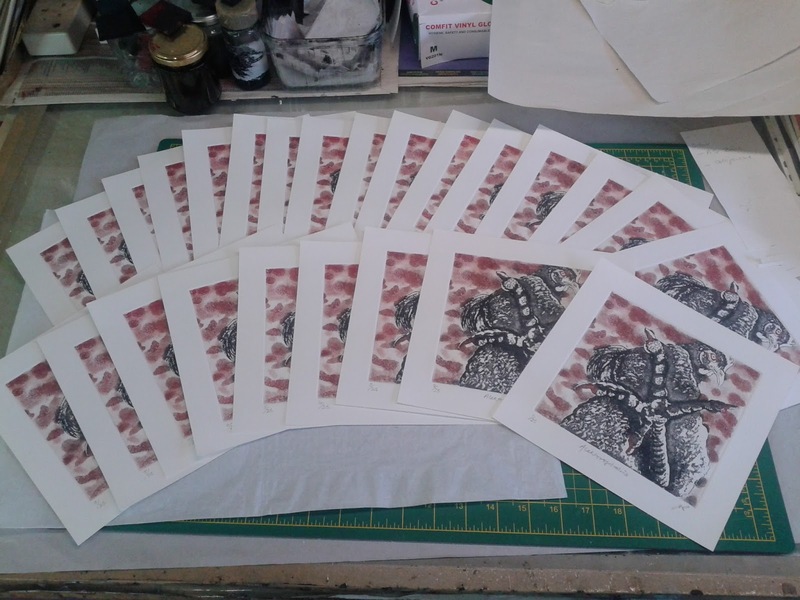 Here they are, all 25, printed, cut to size, numbered, titled and signed. Most satisfying. 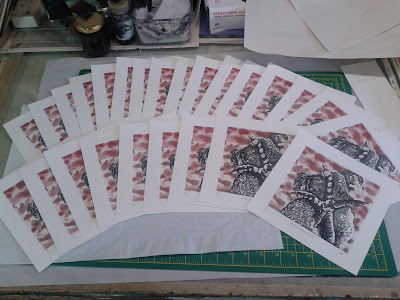 I finished printing them a couple of days ago and in the evening, when the last one had come off the press, I had the most contented feeling of completion. It felt almost like a ritual... ceremonial as I cleaned and dried the plate for the last time, covered it in grease, wrapped it, labelled it and stowed it carefully on the shelf with my other finished plates. It was a strange feeling; a feeling of finality but in a good way. The feeling of a job well done. Can't say I've noticed the feeling before... it wasn't unpleasant. It's been quite a long haul this project; it's been a few years since I printed an edition bigger than ten, and each of these took an hour to ink, wipe and pull. I only pulled two duff ones in an edition of 25 though so that's not bad. I've improved somewhat since the last big edition where I must have printed almost twice as many rejects as good prints. So, 20:20 is done, wrapped in tissue paper and ready to hand over (though not for a while yet) and it's straight on to the next project: the Artists' Group 2014 calendar. Watch this space.